I'm not exactly sure when this more grown up version of you decided to appear, but I finally noticed her this week. All month there have been "big girl" conversations about how your "too big" for Frozen and "too big" for this and "too big" for that. We only read chapter books these days, and you've been asking for a boy Barbie (insert dramatic eye roll here). You've taken more of an interest in clothes, and shoes, and even jewelry. You sit at your little vanity just about every morning and apply lip gloss before school. It's almost as if overnight you developed a big girl personality, and you are now this extremely funny, sarcastic, sensitive, loving, and artistic little girl who has fully replaced my sweet and timid baby. You've grown into the girl who looks just like her Aunt Mandy when you crinkle your nose to laugh. The girl who hides plastic rats at her dad's house to scare her step mom. The girl who loves tickle fights, swimming, and who recently became a whole lot braver on the playground equipment. 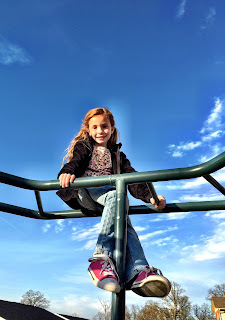 The girl who discovered this year how much she loves roller coasters, and zip lining, and really just about anything that is dangerous. The girl who is finally able to read all of her favorite books and who does it with such a flair. I could listen to read for hours. The girl who no longer asks me to hold her and who really only needs me to wash her hair. The girl who does homework and who spends most of her time dressing up her American Girl dolls, watching Jessie, and drawing me the most beautiful pictures. The girl who loves her horse, and who dreams of being a championship barrel racer. The girl who chooses boots and jeans at her dad's and the most frilly dresses when she's with me. Oh, how I love you so. I know 6 was a big year for you. It was full of so many changes. You adjusted to life with a new mom and your moved into a new-ish house. You got a new teacher for first grade, and two new sweet little boy cousins. I'm sure 6 seems like a blur, and trust me, I feel the same way. I feel like it was just yesterday I was pushing you on the swing set right before your 6th birthday-wondering what the year would hold, and this week we wandered over to that same playground with that same swing set to play on it one last time and say our goodbyes before we move. Yes. It's been a hard week for a birthday week. We've cried alot-you and I. It's so hard, baby girl. And I know that no matter how wonderful and great the change may be-there will always be parts of it that sting just a little. We're closing a chapter this week aren't we, baby girl? A chapter that required alot of growing up from me...and from you. A chapter that made us stronger and that brought us even closer. And I know that 7 seems scary and full of so many unknowns. But, I know we'll get through it. We always get through it. Because, for as long as you can remember, it's always been just me and you-even during those early years. We have found a comfortable routine-our way of doing things. And I know that seems to all be changing...because it is. But, I promise it won't be long before we settle into this new way of life. This shift from two to three with a man who loves us so very much. And I'm sure that eventually you will barely remember our little apartment days, and it will seem like this new way is how we've always done it. But, I promise to hold on to our little apartment memories. I promise that we will talk about them, and laugh about them, and remember them for the days when you have your own little apartment. These memories will always be some of the best parts of us, baby girl. But, I have a feeling that our new memories in our new house with our new person are going to be our best ones yet. So, take my hand and hold on tight. Because all of my best adventures have been with you.